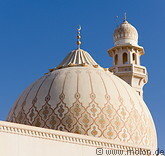 The Sultan Qaboos mosque in Salalah was inaugurated in July 2009. With a total site area of 40149 m² it can accomodate 3200 worshippers. The built ground floor has an area of 7360 m² and consists of a main prayer hall with an area of 2500 m² and a height of 12m. The central dome has a diameter of 15m and a height of 36m. The mosque has four entrances and two minarets.